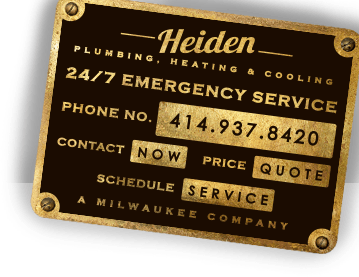 Heiden Plumbing, Heating, & Cooling is ready when you need us. Nights. Weekends. The wee hours of the morning.  If your toilet is overflowing; if your sump pump has stopped working, and it’s raining heavily; if you’re having any kind of a plumbing emergency; we’re here to help. 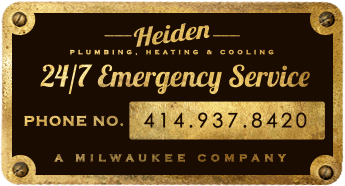 Call Heiden when you’re having a plumbing emergency. Our emergency services aren’t restricted to only plumbing problems. We also provide emergency services for HVAC and Sewer & Water problems as well. Your satisfaction as our customer is important to us. We rely on repeat and referral customers, and take genuine pride in a job well done. With Heiden, you can be assured that you're dealing with professionals who keep your needs and preferences at the forefront. Over time, the technologies surrounding plumbing, heating, and air conditioning have evolved, and Heiden has been right alongside. We are constantly expanding our services to reflect our efforts, and so can offer you state-of-the-art performance based on time-tested methods and the latest tools and materials. If you have plumbing issues, we can help. This includes more than just the emergency services mentioned above. When it comes to plumbing, we run the gamut. Every tool we need to get a job done is with our plumbers when they arrive on the job. There’s no running back and forth from the job site to the office. When we get to your home or business, we’re there to get things done, and, when we leave, you can be sure the place is in just as good of shape as it was when our plumbers got there. The weather in Wisconsin is unpredictable. Anyone who has lived here for 365 consecutive days knows it. You may need your furnace on one day and your air conditioning the next. From snowplows to lawnmowers. Milwaukee County residents deserve to feel comfortable throughout the year, all four seasons, 12 months, 52 weeks, 365 days. That’s why Heiden Plumbing, Heating, & Cooling provides the best heating and air conditioning solutions across the county. Not only does having heating and cooling make the seasons bearable, but it also saves elderly lives. Don’t forget about our 24/7 emergency services. We come out to your home or business anytime of the day or night to fix any issues you may be experiencing with your HVAC units, allowing employers to maintain production, workers to pay rent or mortgages, and families to remain comfortable in their own homes. Our goal is to make sure you’re happy with the services we’ve provided. We meet our goals. Heiden’s plumbers find your lost rings, replace sewer lines, and much, much more. And, as always, we provide our services at the best possible price. In 2001, WITI Fox Channel 6 and Katrina Cravy performed a sting operation on the Milwaukee plumbing industry relating to various plumbing companies to see if and how they took advantage of customers. Heiden was one of three companies, all of which were ambiguous of the sting operation that was brought in to repair a toilet. While the other companies wanted to charge $250-$600 dollars, Heiden fixed the problem for $85.